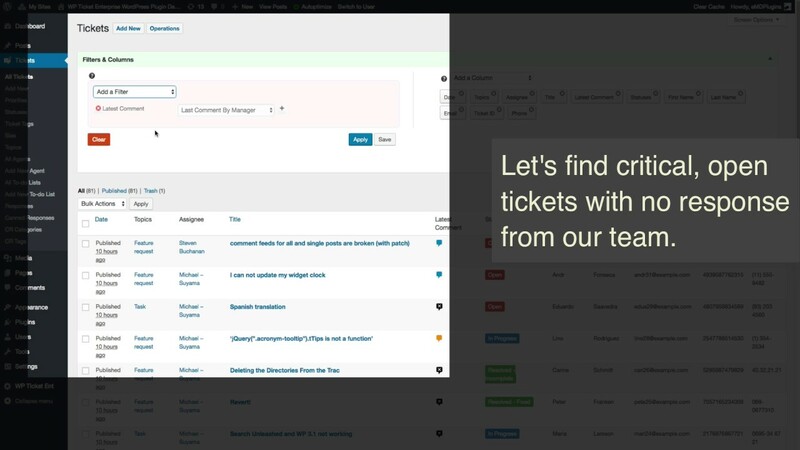 The Smart Search Addon for WP Ticket helps you to filter through your support tickets, to-do lists and agents and generate reports. Search, create reports and enable/disable columns on your support tickets, agents and to-do lists. Search using multiple criteria supporting search operators. Find all support tickets assigned to an agent. Find all in progress status support tickets with critical priority. Find all support tickets with due date today. Find agent assigned to a ticket. Find to-do items for a ticket. Save your searches that you perform regularly as custom reports. Create and save dynamic filters to track what's important through time. Export your search results to PDF or CSV. Easily configure your lists by selecting the columns to display when viewing your entries. Sort the support tickets, agents and to-do lists by fields.